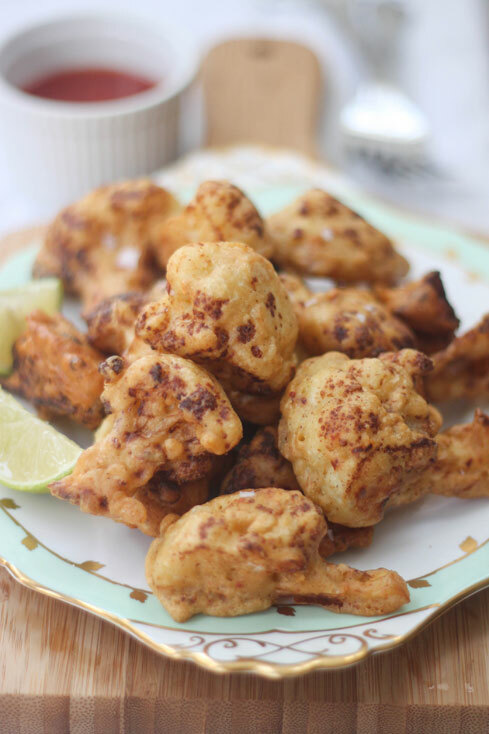 Deep Fried Cauliflower | I Can Has Cook? That’s right. You heard me. Deep-fried mutha-fuppin’ cauliflower. This is an outrageously bold use of our floreted friend, and uses the gram flour mix I’ve been using for onion bhajis to its tastiest effect yet. It takes only a few minutes to prepare and works really well as a shared starter for friends as it actually tastes better when they’ve cooled down slightly. I had mine with some sweet chilli sauce but they’d be great with a yoghurt-based dip. Next time I’ll probably whip up a bit of yoghurt, chopped coriander and a squeeze of lime juice as an extra dipping sauce. Nom. Make a spicy batter by sifting 100g of gram flour and ½ teaspoon of baking powder into a large mixing bowl. Add one teaspoon of ground cumin, one teaspoon of ground coriander, one teaspoon of chilli flakes and a teaspoon of salt. Mix well and then whisk in 150ml of cold water to make a light batter. Chop one small head (or half a large head) of cauliflower into bite-sized florets and mix them into the batter until well covered. Very carefully, heat about 3cm of vegetable oil in a large, deep frying pan. Add a little bit of the batter. If it bubbles and starts to brown, the oil is hot enough. Add the battered florets, being careful not to over-crowd the pan. Fry for a few minutes, turning once, until both sides are golden and brown. Drain on some kitchen towel. Serve the fried florets covered in a sprinkling of sea salt, with some sweet chilli sauce and slices of lime on the side.